The very concept of the “TV Movie” has changed over the last few years as Emmy categories allowed individual episodes of anthology series to qualify. Consequently, episodes of “Sherlock” and “Black Mirror” have won the last several Emmys for TV Movie, replacing the more traditional two-hour offering that we used to get from the networks and still get from places like HBO. I’m not here to argue that something like “Paterno” should be in a different category than something like an episode of “Sherlock” (although it probably should) but only to set the stage for Hulu’s latest interesting venture, “Into the Dark,” which endeavors to deliver an old-fashioned original TV movie every month for horror fans who subscribe to the service. These aren’t episodes—they’re standalone movies, each running the length of an average theatrical with their own casts and crews. The only commonalities they share are Hulu, producer Jason Blum, and that each is based around the holiday in which they premiere. Which brings us to “The Body,” the Halloween-centric premiere film of “Into the Dark.” While there are a few elements of Paul Davis’ expansion of his short film that stand out as opposed to a lot of straight-to-video horror films, let’s just say that the producers of “Black Mirror” don’t have to worry about anyone stealing their annual Emmy any time soon. 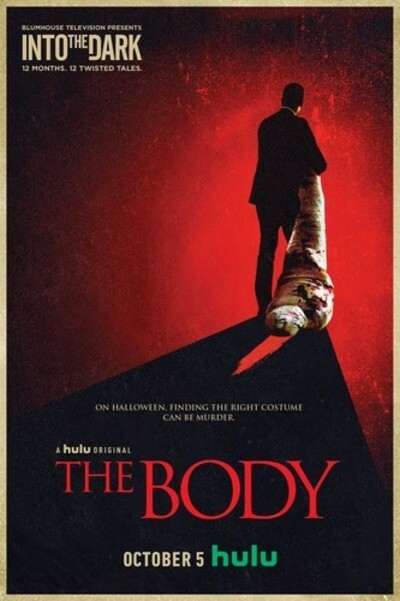 The premise of “The Body” is a clever one, and a concept that very likely worked well in a 17-minute short film but stretches way too thin in an 82-minute one. Tom Bateman plays Wilkes, a suave hitman who has modeled his worldview after Patrick Bateman of “American Psycho” (one has to wonder if the surname led the casting director to Tom). Wilkes likes to wax philosophical about how little human beings matter in the grand scheme of things. On an evolutionary scale, we’re all equal. We only delude ourselves into thinking our individuality matters. And that perceived equality makes it pretty easy for Wilkes to do his job. One thing you have to give “The Body” credit for is that Wilkes is no “hitman with a heart of gold.” He’s a sociopath, who enjoys killing. The death scenes in "The Body" are brutal, reminding one more of the bloodfests of the '80s before horror films diluted their gore to get a PG-13. In the opening scene, Wilkes is told that he has to get his latest, already-handled target, who lays dead in his apartment, from point A to point B by a certain time. Given that it’s Halloween, Wilkes correctly presumes that no one will hesitate when they see a man with blood on his face dragging a body wrapped in plastic. In fact, they’ll just presume he’s got a wicked costume. And that’s exactly what happens when Wilkes crosses paths with three young people who convince him to come their party. They want to arrive with the dude in the awesome hitman costume. At the party, Wilkes meets a woman named Maggie (Rebecca Rittenhouse) fascinated by his intensity and adds a few more names to his kill sheet for the evening. The biggest problem with “The Body” is at its center in Bateman’s flat, emotionless performance. Davis and Bateman were clearly going for a kind of quiet menace, but that doesn’t translate—perhaps diffused by the small screen in ways it wouldn’t be on the big one. Wilkes is straight-up boring. In the second half, he verges on becoming more like classic slasher icons like Mike Myers or Jason Voorhees—in that he’s supposed to be more of a shape than a character—but there’s a much stronger version of “The Body” in which Wilkes is actually as charismatic and interesting as he thinks he is. In this version, he’s a boring black hole and the film drags whenever he’s around. The supporting cast is slightly more interesting, but Davis doesn’t quite know how to manage the tonal differences among them. The Maggie arc, in which a woman who talks about Marie Antoinette and mansplaining in the first scenes becomes fascinated by a lunatic, could have been its own short film. The trio of friends who end up on the run from Wilkes with the body could have been their own short film. They don’t exactly work together. Having said that, Aurora Perrineau, daughter of Harold, makes a charismatic impression as the only leader in her trio of fleeing friends. She does a lot with very little and I’m eager to see what she does next. I would say that about Paul Davis and the entire concept of “Into the Dark” too. This one is a tonal mess, but there’s reason to believe that Blum and his team could find a gem in here somewhere. They’ve got 11 more months to dig.